When engineers, physicists, and other scientists began making materials for nuclear bombs, the Manhattan Project sites around the country including Hanford, Los Alamos, and Oak Ridge were wrapped in World War II and Cold War secrecy. The processes, products, and, most importantly, the waste they produced were hidden from the American public. Even people who lived near the test facilities were unaware during the early years of producing the radioactive and toxic matter for atomic bombs. Outside of some Department of Energy employees and contractors, few knew the consequences of this new science: tons of spent nuclear fuel, millions of gallons of radioactive liquids, millions of cubic yards of tainted soil, and over a trillion gallons of contaminated groundwater. The federal government withheld the information until the 1970s and 1980s, when public pressure forced the release of records and prompted the government to accelerate cleanup efforts. Even now, political dynamics and a culture of stonewalling block progress toward fully containing the contamination. 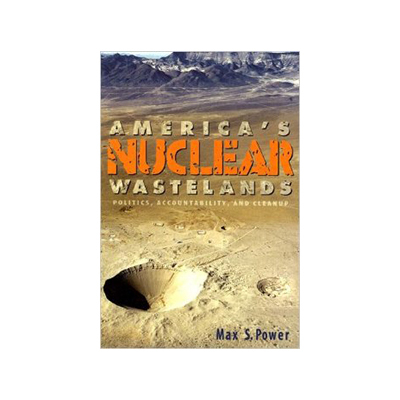 Max S. Power, an analyst who worked on nuclear cleanup issues for two decades, lays out the history and challenges of our nuclear waste legacy. He acknowledges the enormous cost, the complex science, the sticky policy issues between federal and state governments, and the real and perceived public health problems. But America’s Nuclear Wastelands offers more than a review of the dilemma. Power’s use of real-world examples, mostly non-technical language, and informative sidebars furthers his eventual solution: engage the public in this extremely important policy debate over what we should do about our nuclear waste. He contends that governments left to themselves will not solve many critical problems. They don’t have the political will to complete the cleanup work or commit the money. Only with involvement from the public can a transparent, accountable, and fiscally responsible cleanup program begin to address the pressing health and environmental problems from nuclear waste. Power makes the call to action without hyperbole or cataclysmic predictions, and he acknowledges progress and the scientific complexity of nuclear waste cleanup. Theoretical physicist J. Robert Oppenheimer said about the atomic bomb, “When you see something that is technically sweet, you go ahead and do it and you argue about what to do about it only after you have had your technical success.” The notion could apply to the waste created in producing those bombs. Technical success was achieved, but now it is time to do something about the byproducts. With this concise and readable book, Power has provided the public with an important tool to take part in the cleanup decisions. He lays out a plan to avoid past mistakes and make long-term progress in cleaning up our nuclear wastelands.